The book of Leviticus in the Old Testament has for far too long not received its due attention. L. Michael Morales explores rather brilliantly and comprehensively its central role in the Pentateuch and its significance to overall redemptive history in his fantastic book. Who Shall Ascend the Mountain of the Lord? is not just an explanation of Leviticus, it is exploration of the rich theology of the Pentateuch as a whole. Despite focusing on Leviticus, Morales actually helps readers explore the depths of the Pentateuch in total. The book can essentially be broken down into three parts, though these divisions are not expressly stated in the book itself. The first section explores the centrality of Leviticus to the Pentateuch. “As the central book of the Pentateuch, Leviticus contains the heart of its theology,” writes Morales (9). 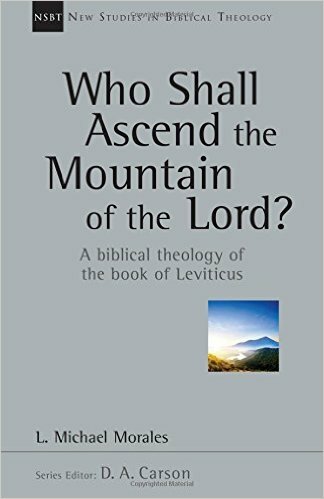 The prologue and the first three chapters establish this centrality and the progression of the Pentateuch up to, through, and beyond Leviticus. Chapter one focuses on theological and narratival structure of the Pentateuch, doing a better job, I believe, than John Sailhammer does in his work on the structure of the Pentateuch (The Meaning of the Pentateuch), despite not being as thorough. Chapters two and three focus on the books of Genesis and Exodus, respectively, as the “narrative context of Leviticus.” In all, Morales argument is that the Pentateuch unfolds, and Leviticus in particular emphasizes, the “theme of dwelling with God in the house of God, and how that reality is finally made possible” (20). Part two we might confine to chapters 4-6. Here Morales focuses on the thematic develop of dwelling with God across the 27 chapters of Leviticus itself. He breaks the divisions according to dramatic movements: Approaching the House of God (Leviticus 1-10); Cleansing the House of god (Leviticus 11-16); and Meeting with God at the House of God (Leviticus 17-27). While not a strict commentary the insights that Morales gives us in these chapters are captivating and will shape and influence any exposition of the text. I suspect this book will shape any future preaching of Leviticus I do. The final, unofficial, division of the book wraps up chapters 7 and 8 by focusing on the theme of Zion. Chapter seven explores the “earthly house of God” through the narratival movement from Sinai to Temple. Chapter 8 highlights the “heavenly house of god” by exploring the language of the spiritual Zion, and its relationship to Christ. Who Shall Ascend the Mountain of the Lord? is a phenomenal work, and likely my favorite volume in the New Studies in Biblical Theology series from IVP. I regularly found myself amazed by Morales’ insights and his development of the theology of the Pentateuch. His focus on the literary structure of the Penateuch, for example, identified fascinating parallels for me between all the five books. I was struck by the repeating of themes and the progression of the people towards God. By focusing on Leviticus he gives us more than just an understanding of one book. The relationship of Leviticus to the rest of the Pentateuch opens up the deeper meaning of the latter. In particular I was struck by how much I learned about Genesis and Exodus from this study. Here again, the development of themes and their building to greater expression in Leviticus was astounding. I will not read these familiar accounts in Genesis the same way again. I know for many future studies, on many diverse books and topics, I will find this volume handy as a reference. The book is highly accessible, despite being written clearly as an academic volume. I highly, and I cannot emphasize that enough, highly commend Who Shall Ascend the Mountain of the Lord? to all readers.